Growing up around music all his life, most of Paulo’s immediate and extended family were musicians. Picking up the drums at age 9 while growing up in a rich Portuguese community in California, he also began studies in saxophone and clarinet early in his teens. Later, his performance versatility expanded to piano, flute, and accordion. Paulo served several contracts with Royal Caribbean Cruise Lines, drumming with and arranging for musicians from all over the world in various locations in the Caribbean for thousands of people. He has performed with singer/songwriter Tori Harris, guitarist Dan Bell, singer Vern Tremble, singer/actor Marcus Collins, violinist Dominique Ava, singer/pianist Jacqui Scott, singers Jack Walker and Hal Frazier, singer/impressionist Sean O-Shae, multi-instrumentalist Oscar 'El Gaucho' Silveira, and xylo-synth player David Meyer. Since moving to New York, he has performed at historic venues in New York such as Carnegie Hall, The Bitter End, The Bowery Ballroom, Joe’s Pub, Cleopatra’s Needle, Tutuma Social Club, the Cake Shop, Berry Park, Rockwood Music Hall, Sullivan Hall, Duplex Cabaret Theater, and Zebulon. He has performed at Musikfest in Bethlahem, PA, the Decatur Celebration in Decatur, IL, the Bele Chere Festival in Ashville, NC, and the Blue Note Jazz Festival in New York, NY. Paulo's current projects are headed up as the full-time drummer and co-colaborator with the Nashville-based indy-pop-rock band ELEL. This is an exciting 6-8 piece band that brings together elements of rock, electronica, jazz, layered harmonies, loops, and basically anything that is available out there. The brain-child of Ben Elkins, ELEL regularly opens for the oft-touring bands Moon Taxi and Ripe. Since Paulo has been part of the band in early 2017, ELEL has been featured at such prestigious events as Frist Friday, Musician's Corner, The Hop Sauce Festival, and SXSW. His current focus (as of February 2019) is a focus on teaching at Nashville Big Picture High School, where students have 8 hours per week learning about instrumental techniques, arranging, composition, music theory, and band performance. They focus on using multiple versions of Garageband on school provided Macs along with a good amount of instruments that have collected over the years by this school to provide students with a lot of options for performing together. Other projects Paulo has been involved in: Drummer and co-arranger for the Pop cover-band The Titanics; studio work for the Brooklyn-based Catholic praise and worship group, New Name; arranger and drummer for the comedy big band featuring Jason Tractenburg called The Pendulum Swings, and the Portuguese Dance Band Sem Duvida from Mineola, NY. 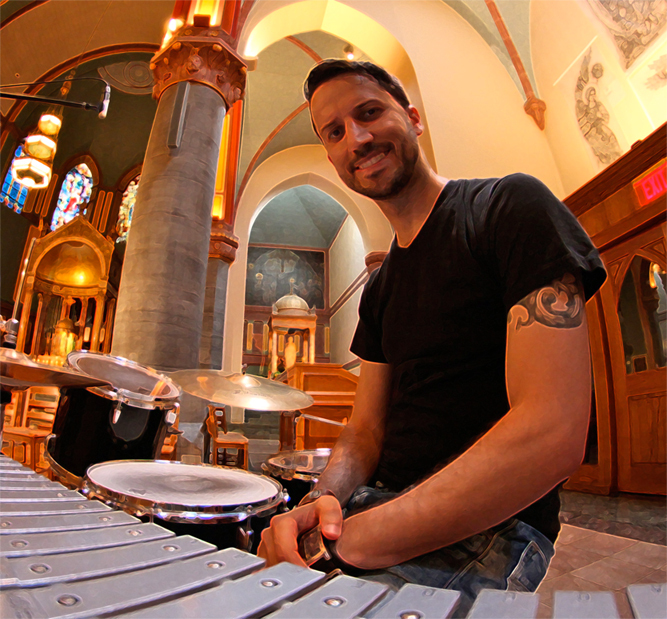 He is also active as a percussionist and fill-in musical director for Catholic and Protestant church services at St. Paul the Apostle and The Journey Church. He has performed in productions of “Man of La Mancha”, "You're a Good Man, Charlie Brown", “Into the Woods”, “Footloose” and with such musicians as congero Carlos Caro, bassists David Ambrosio, Tim Ferguson, and Bob DiGiacomo, guitarists Tom Dempsey and Shu Sushimoto, saxophonists Jeff Ellwood, David Englehard, Wayne Escoffery, Oscar Feldman, Javier Arau, trumpeter Dan Blankenship, singer/songwriters Danica Dora, Nick Blaemire, Haley Dreis, pianist/arranger Garrett Taylor, jazz pianist Deanna Witkowksi. He also composed and arranged for various Portuguese performance groups throughout California and composed original an original soundtrack for a production of The Crucible at the LAB school in New York City in Spring 2011. He also completed a composition commission to write an original piece of bullfight music for Portuguese Marching Bands as a tribute to the bull-grabbing group, Forcados de Turlock from Turlock, CA, which premiered summer of 2012. Arranging credits include co-arranger on the musical Dr. Glassheart, originally written by Jason Tractenburg, and collaboration with arranging/recording for the “Luke Live” with Fr. James DiLuzio.